Digi-Schlock: THE SENTINEL (Scream Factory Blu-Ray) – Schlockmania! The Sentinel doesn’t have the best critical reputation but that doesn’t mean anything to the horror fans who love it: they’re used to having their chosen fare treated poorly by the critical establishment. Thus, it is perfect fodder for a special edition, having inspired a devotion that lingers amongst the selected few. 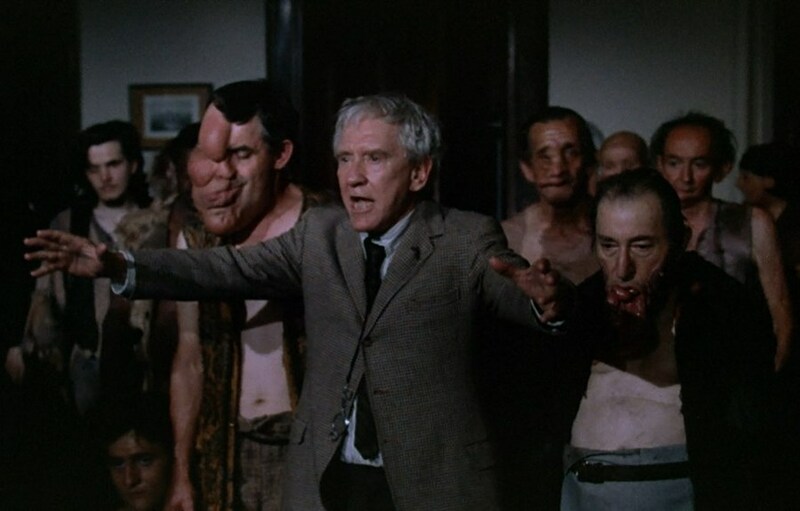 Those fans should thank their lucky stars because Scream Factory has brought the film to blu-ray and added a fistful of extras that take the viewer into the crazy creation story behind the crazy onscreen story. It all begins with a new transfer that has a nice vintage celluloid look, giving an HD boost to the color and detail levels without any digital tinkering. The original mono soundtrack is presented in lossless form and this presentation does well by this well-mixed straightforward vintage track. Scream Factory has not listed this as a full-on special edition but it has a nice package of extras nonetheless. The heart of the bonus features is a set of three commentary tracks. The first pairs novelist/producer Jeffrey Konvitz with moderator Nathaniel Thompson. Konvitz covers a lot of ground, starting with the complex genesis behind the novel and film before moving into production stories, including some darkly funny tales of studio shenanigans and Michael Winner’s ego. Thompson keeps the track focused by asking good questions that get Konvitz to reveal his far-ranging career, including subsequent novels and his early screenwriting credit Silent Night Bloody Night. It’s a compelling listen for horror fans who have ever wondered about Konvitz’s career. The next track is a solo effort by Winner himself, taken from a prior European DVD release. He is irreverent and gossipy from the get-go, maintaining a steady stream of comments as he shows off his infamously combative and egotistical persona. He swoons over his older stars, defends his use of handicapped people in the finale and manages to take bitchy potshots at Konvitz, Cristina Raines and Chris Sarandon (a vicious tale about Sarandon’s casting has become infamous amongst commentary track fans). The third commentary track features Raines along with blogger/moderator Shaun Chang. She talks about how she got the role as a result of being a Universal contract player and has nice things to say about everybody on set, with the notable of exception of Winner. Chang is quite knowledgeable about her career and asks plenty of interesting questions about her other credits to fill out the discussion. The two have a nice rapport (there are lots of laughs) and it’s a fun listen for fans who might want to know what the Sentinel experience was like from the actor’s perspective. The major video-based extra on this title is a 24-minute chat with Ralph S. Singleton, who served as second assistant director and location scout on this film and Death Wish for Winner. After giving some background on how he worked his way up the crew ladder, he gets into the nature of his duties on this film (he found the film’s famous brownstone location) and what it was like to work with the notorious Winner, who he says was demanding but took care of his reliable crew members. Singleton has gone on to a career as a producer and director and also offers some interesting insights into the film business. The remainder o f the extras are devoted to promotional materials. A trailer pushes the horror vibe and the all-star cast while two t.v. spots explore similar territory, with the second of the latter using the sideshow performers to a surprising degree. Three image galleries presented in animated form round things out: the first features dozens of stills, the second has a variety of black-and-white press photos and the third has over thirty images of different posters, lobby cards and even pages from the film’s pressbook. In short, this is a nice little edition of a deep-catalog cult favorite that ’70s horror mavens will enjoy, particularly with all those commentary tracks to explore. 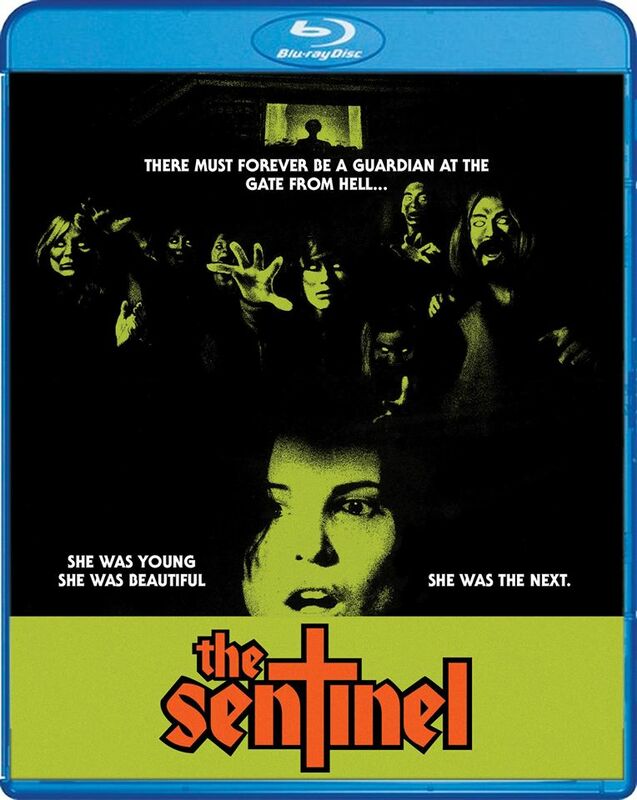 To read Schlockmania’s film review of The Sentinel, click here.